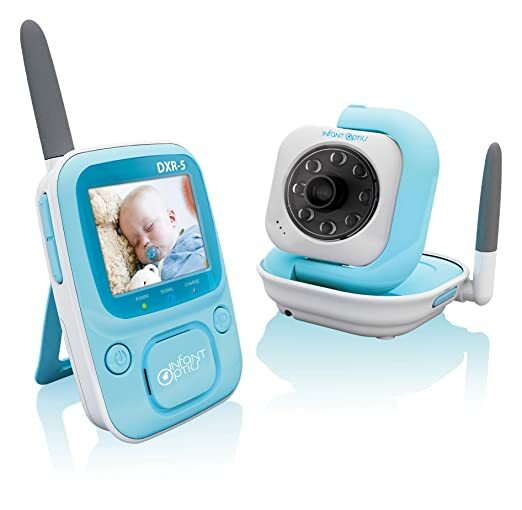 The Infant Optics DXR-5 2.4 GHz Digital Video Baby Monitor with Night Vision is truly a masterpiece in the field of baby monitors, from all points of view. With a lightweight frame, a plethora of useful features, a slim design and a crystal clear image, the Infant Optics DXR-5 is great for caring parents who want to sleep tight at night, without worrying about the safety of their new born baby. That being said, this is a one of a kind monitoring tool that features intuitive functionality, is very reliable and has a lot of benefits that would determine users to recommend this product to their friends and acquaintances. Here you will find some of the pros and cons associated with Infant Optics DXR-5, as described by parents who have purchased and reviewed this product on Amazon and other online retailers. What Are The Main Benefits Of The Infant Optics DXR-5? The fast, crystal clear image delivery is undoubtedly the most important benefit of this video monitor, as it delivers no less than 30 fps, which means that it offers real-time movement. This way, parents will know exactly what their baby is doing, without worrying about image lag, a common problem with many baby monitors. The Infant Optics DXR-5 provides full-color video streaming, it is reliable and it also comes with an advanced white noise reduction feature. In a nutshell, this function is related to the embedded audio shut off feature that allows the device to simply reduce the amount of unwanted noise in the background. This way, you can talk to your baby and hear him in a clear and crisp manner. Parents also seem to be very satisfied with the additional camera capacity – simply put, the Infant Optics DXR-5 can support up to four cameras simultaneously, which is perfect for parents with twins or triplets, as it allows them to keep an eye on all children at once, quickly and effortlessly. There is also an auto voice-based power saving mode which, just as the name implies, allows the parents to automatically switch off the battery saving mode of the camera without even getting out of bed. The product is very easy to set up, it features a user-friendly design and it also comes with a great optimal range that can pass through walls and doors without any problem – it can actually travel up to 150 feet, which is great for particularly large mansions. What Are The Downsides Of Infant Optics DXR-5? If you have decided to invest in a good video baby monitor such as Infant Optics DXR-5, then it is crucial to be fully informed about the device’s pros and cons. This video monitor has its downsides as well, and it seems that the device tends to have a reduced battery life, especially when used continuously. This is a state of the art, modern and cost-effective baby video monitor that is easy to use, straightforward and very easy to mount on the wall. The Infant Optics DXR-5 comes with a simple user menu through which you can easily navigate with several pushes of a button, it delivers clear images and it will offer parents the peace of mind they so much need! Sounds good. I actually bought DXR-8 recently and it’s nice, works well. I think they are slight differences though, especially the price. This can go for those with moderate budget. Hi there, I'm Sandra Sandroval, chief editor at BabyZeen. We created this site to answer those common questions new parents ask to make smarter choices during and after pregnancy. Affiliate Disclosure: The owner of this website is a participant in the Amazon Services LLC Associates Program, an affiliate advertising program designed to provide a means for sites to earn advertising fees by advertising and linking to amazon.com.